Rika Furude welcomes you to the rural village of Hinamizawa. Her mouth forms a joyous smile and her nonsensical greeting of “Ni pah!” somehow puts you at ease. This is Rika Furude – the Miko of the Furude Shrine in Hinamizawa and the sole remaining member of the Furude clan, one of the 3 Great Families that governed the isolated village. A good luck charm to most villagers and an irreplaceable companion to her friends. For a sweet girl with a life risen from a checkered past, Rika has been irreplaceable to her friends Rena Ryuguu and Mion Sonozaki, among others. She has also been irreplaceable among the hearts of many. However, her Saimoé career hasn't had the best of luck in her early days. Failing to make much of a presence in Korea Best Moe 2006 by being knocked out in the early stages, then finding herself in a second round pairing situation in the second round with both Teletha Testarossa (Full Metal Panic) and Chikaru Minamoto (Strawberry Panic), losing to the latter by only 39 votes. 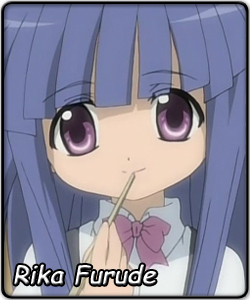 Also, due to the airdate of Higurashi's second season, Kai, Rika missed the 2007 Korean Best Moe application deadline, so she was barred from that tourney completely. So her efforts went straight toward the Anime Saimoé Tournament of Japan in 2007, and it was there that she went on the journey of her life. First, she blew past her first two rounds as other competitors fell one by one in upsets. In the round of 32, she faced of against her friend Mion, to which she won by just short of 360 votes. She followed that up with a 150-vote win over Sayuri Kurata (Kanon) in the top 16, and then reached the top 8. Successfully taking out Louise Francoise (Zero no Tsukaima) by around 300 votes led to a semi-final matchup with past semi-finalist Shinku (Rozen Maiden). In one of the closest matches of all time, Rika edged Shinku by only 5 votes, leading to a final matchup with Nagi Sanzen'in (Hayate no Gotoku), to which she barely won by only 22. In one of the more amazing runs in history, Rika took home her first Saimoé tiara in the biggest Saimoé tournament as of yet. Rika enters the International Saimoé League with one thing in her mind: to prove her championship win was no fluke. Even so, she faces swift competition she has never even seen, including the more dominant forces in Saimoé overall. Despite this, she is determined to overcome these obstacles in an attempt to win the first International Tiara.